Tim Bezbatchenko and Bill Manning talk to season season holders at the Real Sports Bar and Grill in downtown Toronto, Canada. Image by Dennis Marciniak of denMAR Media. Tim Bezbatchenko, Bill Manning and Luke Wileman talk to season season holders at the Real Sports Bar and Grill in downtown Toronto, Canada. Image by Dennis Marciniak of denMAR Media. Tim Bezbatchenko, Bill Manning and Luke Wileman talk to season season holders at the Real Sports Bar and Grill in downtown Toronto, Canada with the MLS Cup in the background. Image by Dennis Marciniak of denMAR Media. The 2017 MLS Cup at the 2018 Toronto FC alternate jersey unveiling at the Real Sports Bar and Grill in Toronto. Image of Dennis Marciniak of denMAR Media. 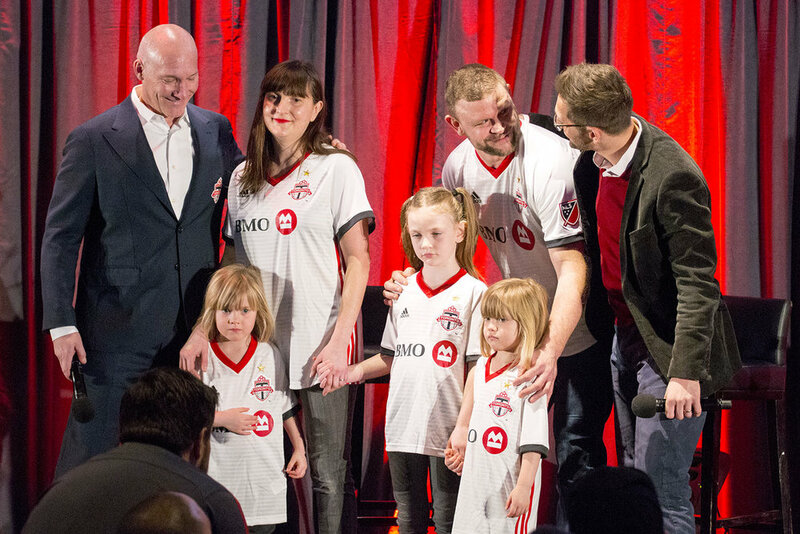 Tim Bezbatchenko and Bill Manning have a family of season ticket holders on the stage to model the new 2018 Toronto FC alternate jersey at Real Sports Bar and Grill in Toronto, Canada. Image by Dennis Marciniak of denMAR Media.